What’s New? 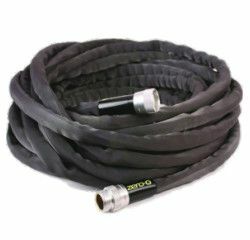 Apex Zero-G – A lightweight, flexible hose that will not burst! After 3 years of selling an expanding hose, we know that customers love the hose, but that love runs out when they burst! It is not the matter of if they will burst, it is more of a question of when. They work and work and work, and then they fail as the expandable inner core continues to expand and contract with each use. They are great for their convenience, but their longevity is not as good as you would expect when purchasing a $40 hose. If you have been struggling to find a lightweight and convenience garden hose for patio plants and other simple watering, we would like to introduce you to the Apex Zero-G garden hose. This hose is made from a leader in the garden hose industry and the makers of the Neverkink line of hoses that have been trusted for years, upon years. What makes this flexible, fabric hose different than its predecessors is the fact that its inner core does not expand. The result is a product that will not weaken and eventually burst when under water pressure. The fabric outer shell keeps the hose lightweight and easy to pull and tug over all surfaces. The high quality aluminum couplings on either side are lightweight and will not wear down like plastic threads do! We feel that Apex has really hit a “home-run” when it comes to a patio hose that is lightweight and easy to use. We have been hearing great feedback on this hose and we are confident that it will hold up year… after year. It is even backed with a 5 year warranty. Available in 25, 50, and 100 foot lengths. Stop by our Lawn and Garden department if you are interested in learning more about the Apex Zero-G garden hose! Uploaded by Teknor Apex - Consumer Products on 2016-03-23.